Save up to 80% on pre-owned Baxter Travenol 6301 infusion pumps. 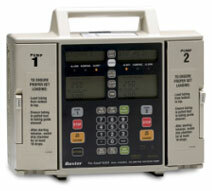 The Baxter 6201 and 6301 are the workhorses of the infusion pumps. Easy to use, or get supplies for. Rugged construction, and a high parts availability, all spell a system that will provide solid service and can be maintained for several years more. 80% charged within 8 hr. Primary program: 1.0-99.9 mL/hr in 0.1 mL increments or 1-1999 mL/hr in 1 mL increments.Upper limit can be reduced by authorized service personnel.